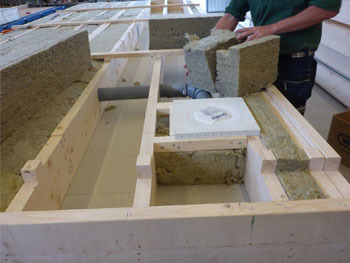 Design and construction of the new Camogli Healthcare Centre, which is to replace Camogli Hospital built in 1971. 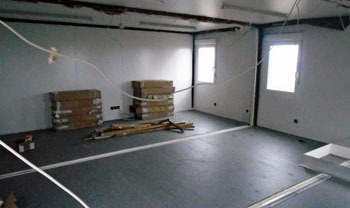 A new Camogli Healthcare Centre is being constructed to replace Camogli Hospital, which was built in 1971. 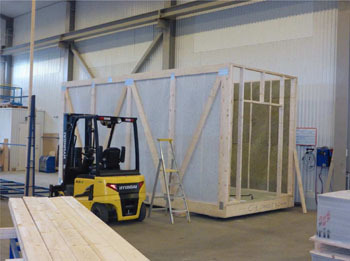 This page covers of all aspects of the project, from design and pre-fabrication, transportation of materials to Tristan and construction, to fitting out of the new facility and its opening. 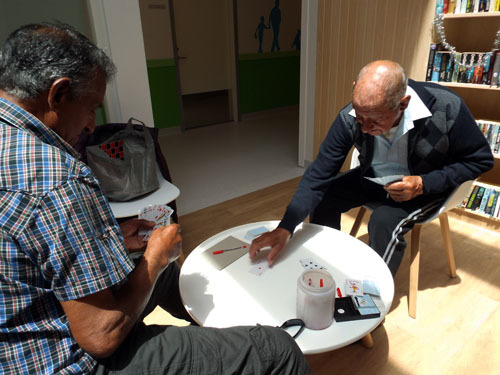 Tristan pensioners met in the Camogli Healthcare Centre on the 28th November 2018.
the new Healthcare Centre on 6th June 2017. 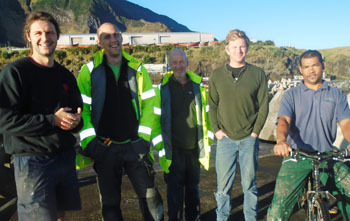 Above : Left to right - Galliford Try Project Manager Mark Aimson, Pacific Askari Captain David Williams and three members of the crew. 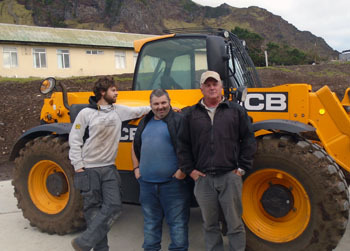 Captain David Williams and Tristan Government Clerk of Works Barry Davies with two members of crew. with the last of the Galliford Try contractors and fellow passengers Sean and Marina Burns. 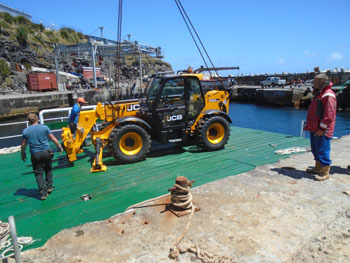 MV Pacific Askari, used throughout the project to transport the Galliford Try contractors, prepares to leave the island on 8th June 2017 to mark the end of the Camogli Healthcare Centre construction. 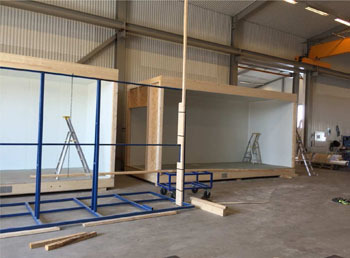 now showing furniture and fittings in place as the centre prepares to open. 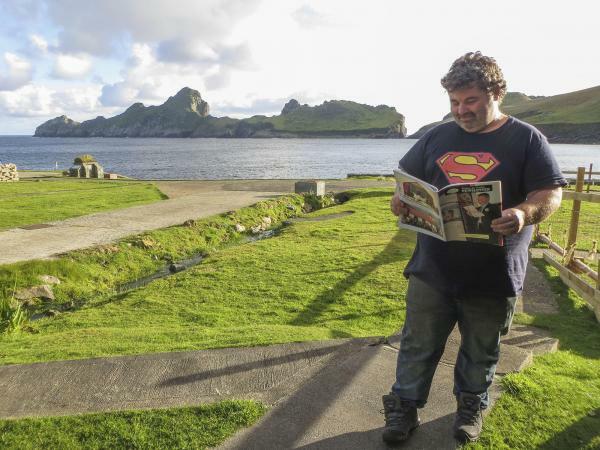 featuring feeding hens, penguins, mollies flying above and the island gong being rung. 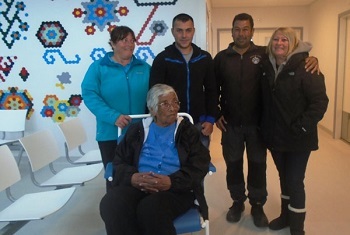 The MV Pacific Askari arrived at TDC on 18th May 2017 with the medical equipment and the two medical commissioning engineers after a rough crossing from Cape Town. 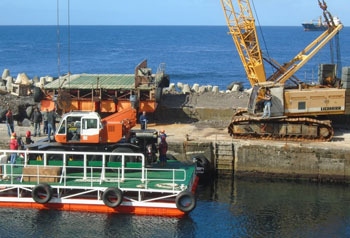 The medical engineers and passengers disembarked that evening. 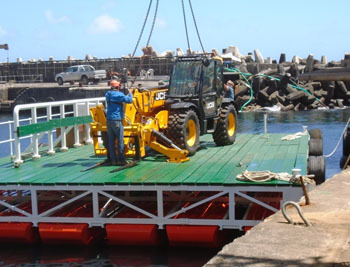 The medical equipment was successfully off loaded from the Pacific Askari on Friday 19th May and brought ashore. 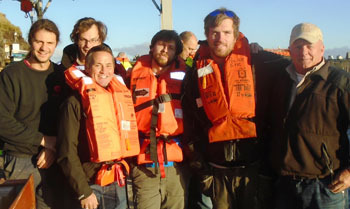 The first team of nine GT employees embarked on the Pacific Askari around 4 pm the same day - 19 May 2017 - and the ship departed for Cape Town on Saturday afternoon. 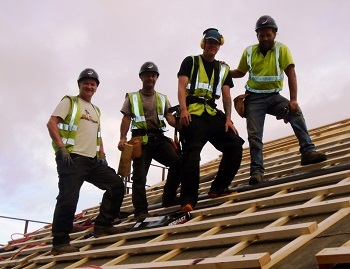 Galliford Try are continuing to make good progress. 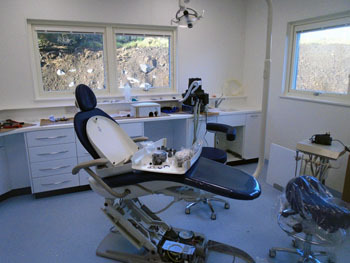 The Healthcare Centre is substantially completed and the final touches being made to the building. 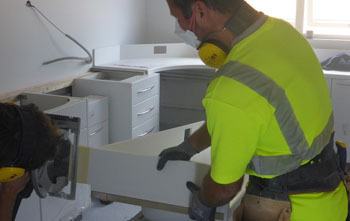 The two medical commissioning engineers are now busy commissioning the new and existing medical equipment and are expected to take around 18 days to complete their tasks. 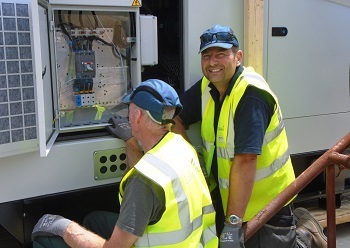 The remaining Galliford Try team are expected to demobilise and depart from Tristan between in early June depending on the weather conditions. 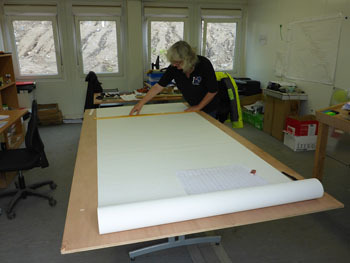 The weather on Saturday 20th May on Tristan is bad, we are in a middle of an infamous south Atlantic storm, so if we hadn't offloaded yesterday (Friday) the vessel would have been waiting another 4 or 5 days for the weather to break to discharge its cargo. 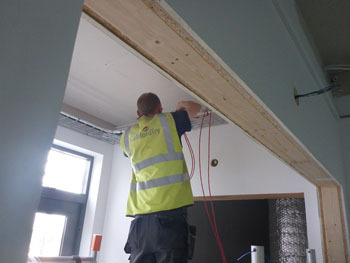 Photos below show Galliford Try contractors with Clerk of Works Barry Davies. 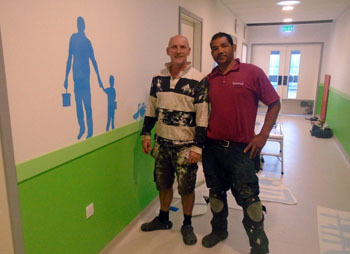 Kate Aimson, the Community Liaison for Galliford Try, has worked with the children and staff at St Mary’s School to design a mural for the new healthcare centre. 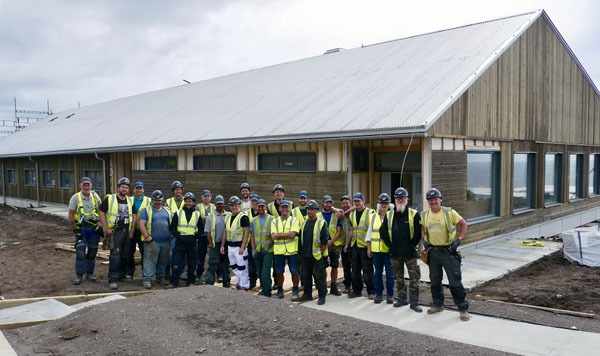 Barry reports on 5th May that the contractor's labour force are making satisfactory progress with project completion and handover expected in June 2017. 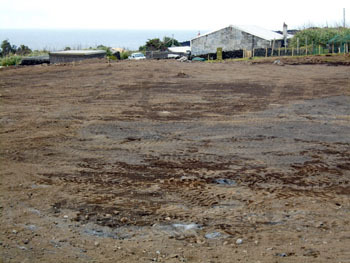 External views of the centre showing ground work around the building taking place. 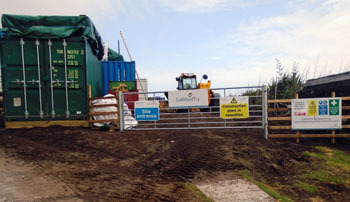 The photo below shows the main entrance, approach road and ambulance turning area. 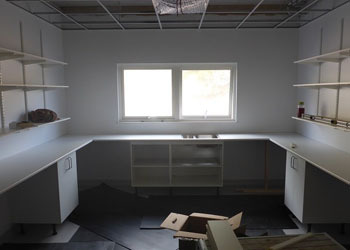 Right: Impressive Family Room with ash panelling and book shelves. 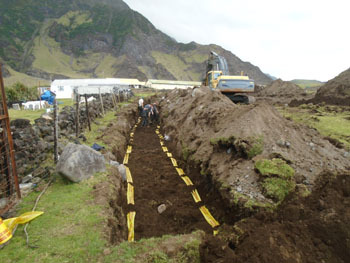 To date Tristan has had 264mm (10.5 inches) of rain in April which has caused widespread flooding. 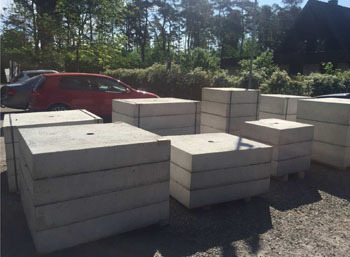 Nevertheless, Galliford Try contractors have continued to make good progress and have entered the final phase of the project. 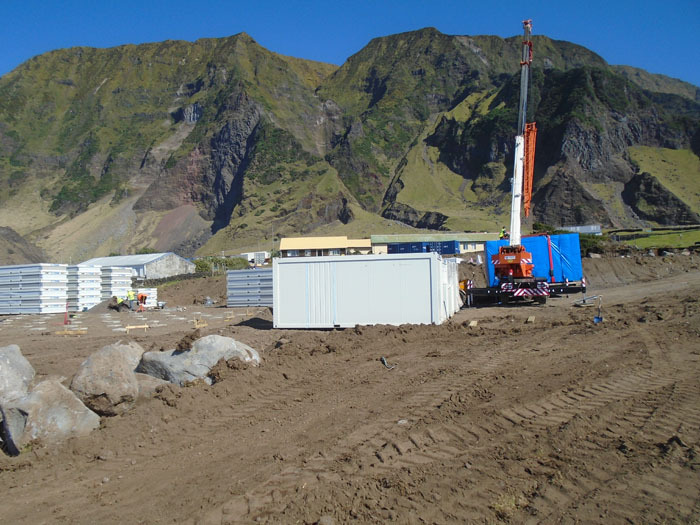 Nine construction staff are expected to leave Tristan da Cunha on 18th May 2017 and Galliford Try is expected to make timely completion and handover of the project by mid June 2017.
and part of the old Camogli Hospital (faded green roof) with the village behind. 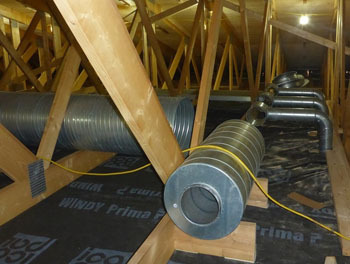 Left: Installing the fire alarm system into the west plant room; Right: Extternal finishings detail. 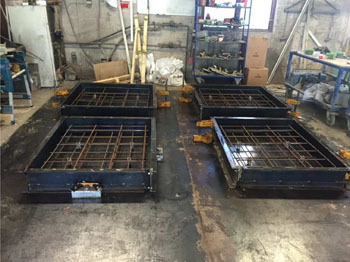 The Galliford Try construction team are making good progress, working diligently and aiming to complete the project by June. 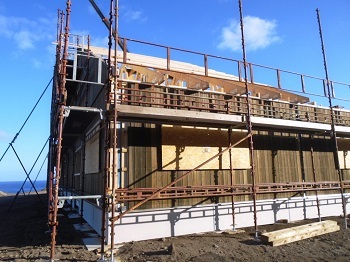 We've all been watching the progress of the new hospital with interest from afar as it's started to take shape. 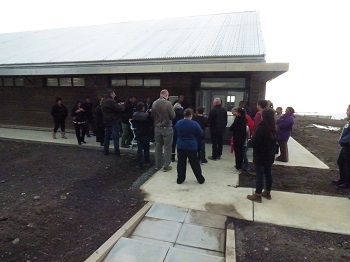 Then, Galliford Try invited St Mary's to come and see how the project is progressing and meet some of the team. Playgroup and Class 1 were first to visit. 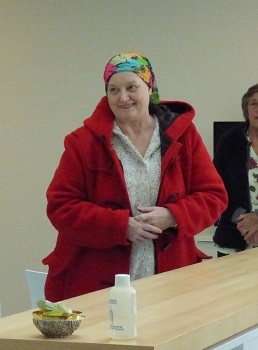 They were met by Mark, the Project Leader and Kate the Community Liaison Officer. 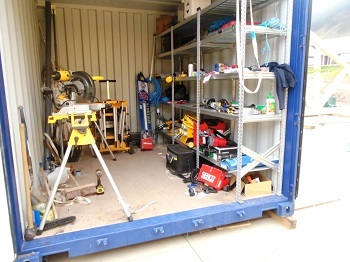 First, the children were shown around the living quarters which the children thought looked very cool although they were amazed at the size of some of the work boots sitting outside the rooms. 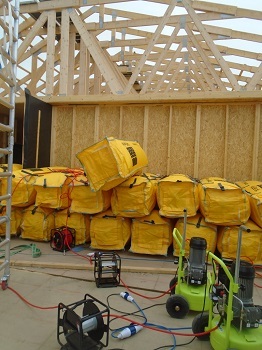 Next, they were kitted out with a hard hat and a high viz jacket. These were very stylish but a little bit big for some of the children. Then, Brian showed everyone one of the JCB Loadall and all the children got to have a go at seeing what it would be like to drive it. Tom, the chef, made some amazing chocolate donuts. Lastly, Galliford Try gave the Class 1 and Playgroup two sets of Bob the Builder books that they had thoughtfully bought for us before coming to Tristan. 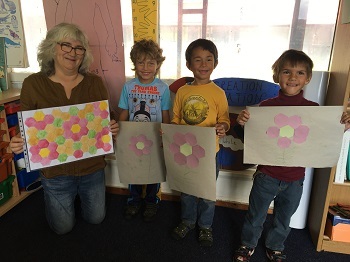 The children really enjoyed these books. 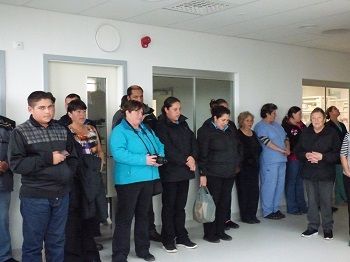 The following week, Class 2, 3, 4 and 5 visited the hospital site. 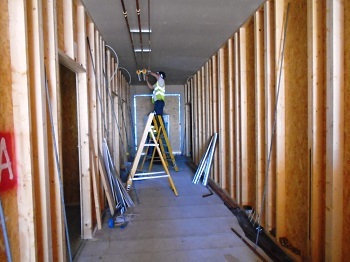 Mark also gave them a tour of the living quarters and then they put on the hard hats and high viz jackets so they could be safe on the site. Class 2 and 3 enjoyed hopping onto Bryan's JCB for a quick photo shoot. 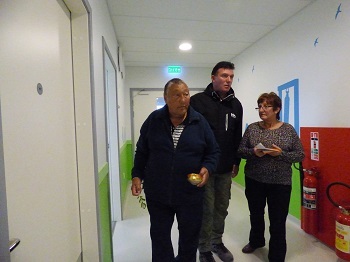 Because Class 2,3 ,4 and 5 were a bit older, Mark took them inside the new hospital and explained the layout of all the different rooms. 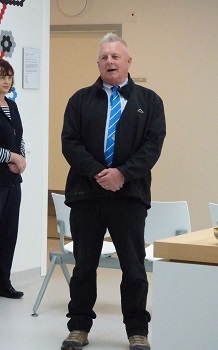 He showed them where the doctors would work and where the patients would stay and the purpose of the other rooms. 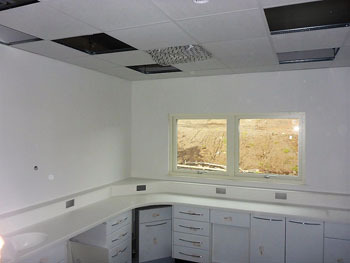 He explained how some rooms had special walls depending on the medical equipment that would be used in there. 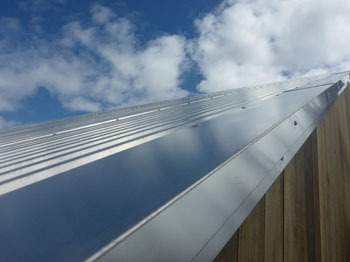 The roof was almost finished as well. 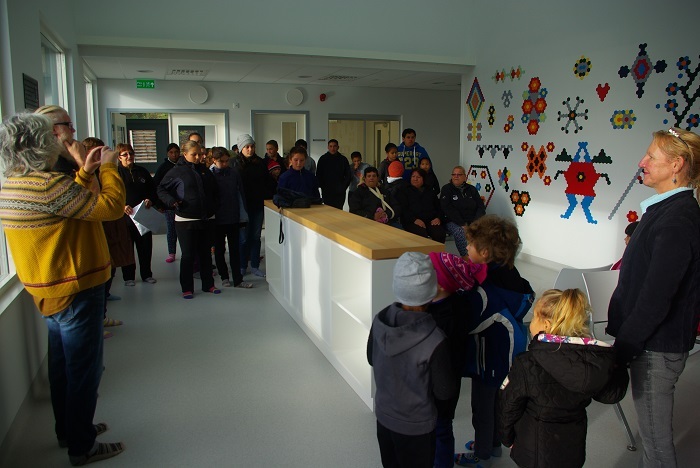 The children were shown offices where Galliford Try have all the plans and shown an artist's representation of what the hospital will look like when it is finished. There was also a gym with equipment for the Galliford boys to use to keep fit and they told the school that when they finish the project they'll be leaving it for the islanders to use. Then, before the classes left, they also got some of Tom's awesome donuts to finish the tour. 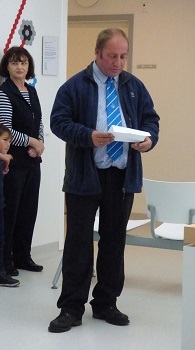 When Class 2 and 3 visited it was Tom's birthday so the children sang Happy Birthday. 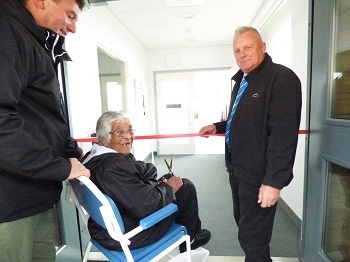 Everyone really enjoyed seeing how the hospital is coming together and is looking forward to visiting again soon. Thank you, Galliford Try! 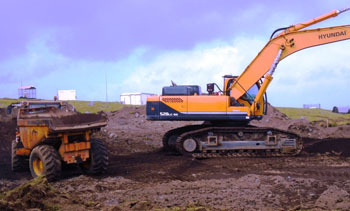 Project leader Mark showing pupils around the site and enjoying the JCB Loadall. at the steering wheel of a JCB. 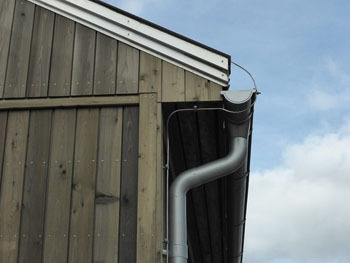 which Barry confirms now means that the building is weather-proofed. 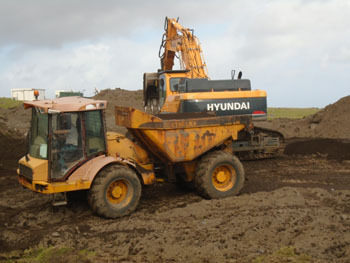 Four more views taken on 22nd February showing site work. 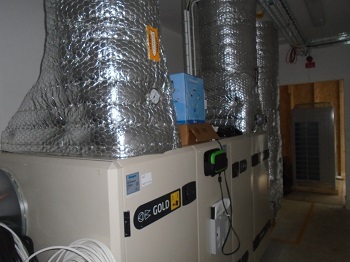 Photo below right shows Les Jones and Michael Groenwald. 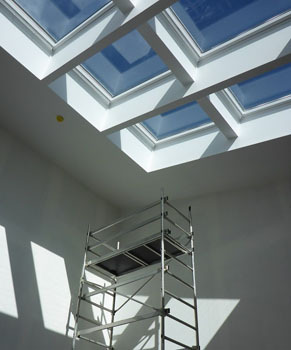 internal decoration and electrical work in porogress. 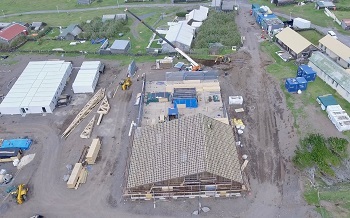 Photos courtesy of Barry Davies and Site Supervisor, Ian Prickett and his flying machine. 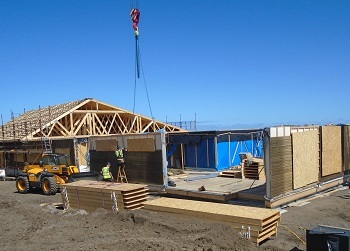 Barry reports that the weather was good during January and is continuing, hence the construction team are making good progress on site. 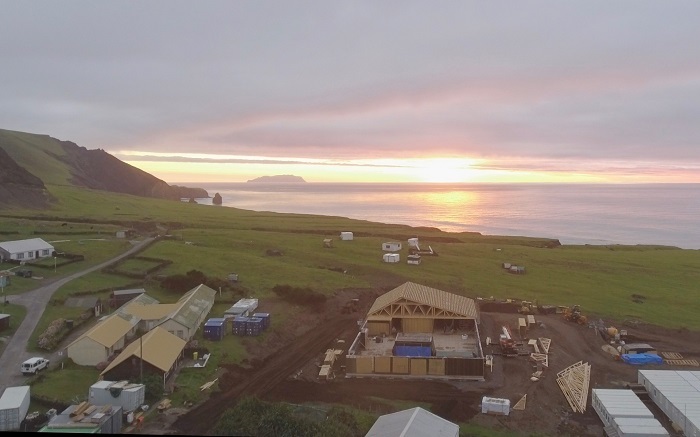 A bird's-eye view of the Healthcare Centre construction site at sunset on the 2nd February 2017 with Inaccessible Island on the horizon. 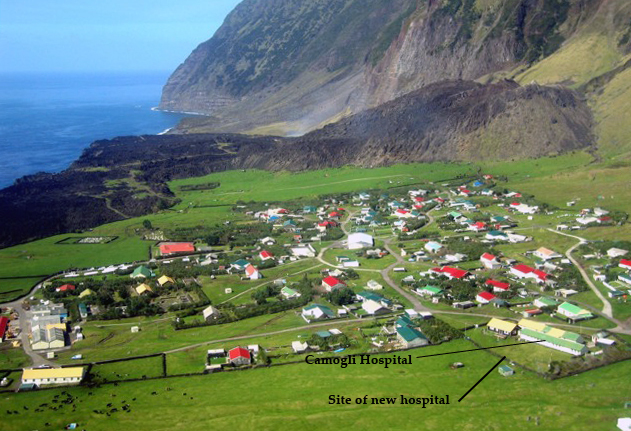 The existing Camogli Hospital is the left with the road leading off to Hottentot Gulch and the Patches. 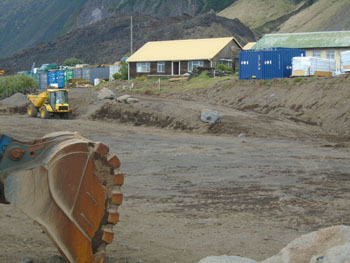 The construction crew's accommodation block is on the right. 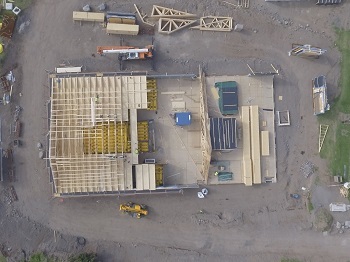 Views taken from directly above show progress with the roof on 25th January (left) and 2nd February 2017. 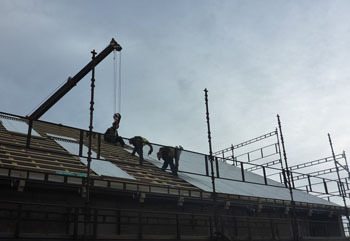 Placing and erecting wall panels on 1st February 2017. 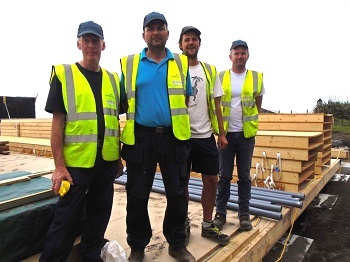 Left to right: Martin Attwood, Zlatko Goodwin-Izmirov, Dale Sewell and Tim Coombes. 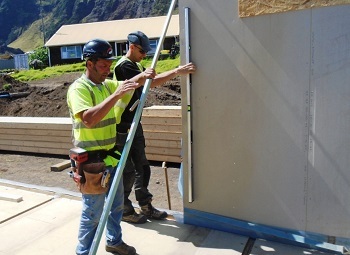 John Taylor & Steve Brown securing wall panel. 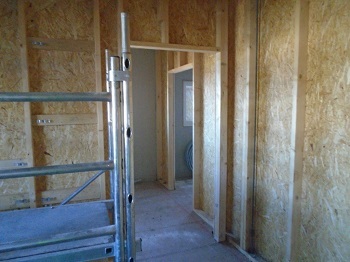 Ongoing works on the internal walls at the beginning of February 2017. 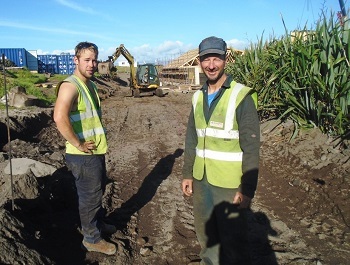 Grant Armstrong & Brian Beck working on grading the access road on 3rd February 2017. 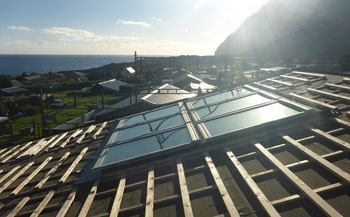 Working on the Healthcare Centre Roof. 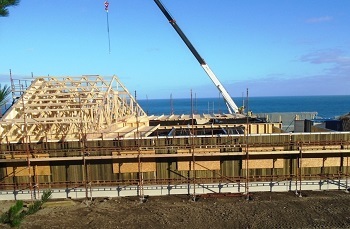 A few more pictures taken on the 28th January 2017, when the construction guys were working on placing roof cassettes. It had rained in the night and was overcast in the morning. 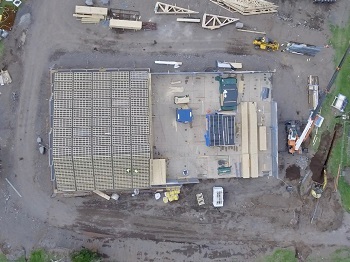 GT are making good progress, so we are hoping for another month of dry weather to enable the building to be weather tight. 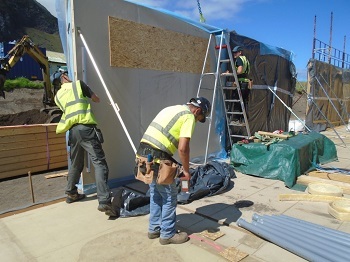 Barry is trying to get a few group pictures of the workers, but it is tricky taking pictures because of the reflector strips on their high visibility vests, so the light needs to be just right. 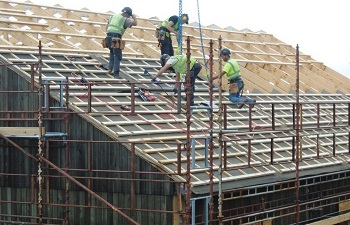 Above: Fixing battens on the healthcare centre roof. 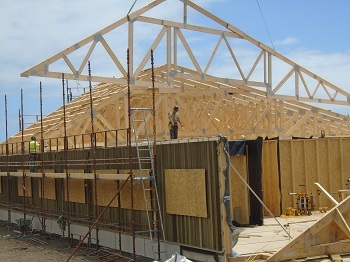 Above right & right: Placing roof cassettes. 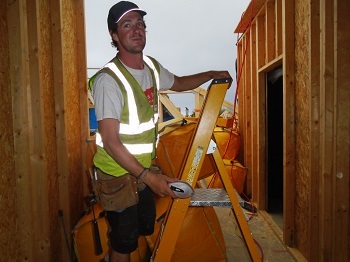 Below: Steve Brown, hooking up roof cassettes. 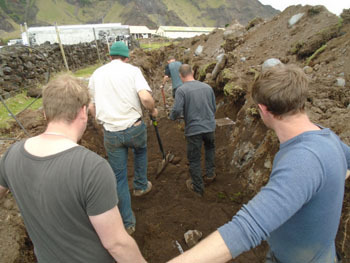 Bottom right (L-R): Ian Prickett, John Taylor, Mikael Larsson & John Sanders. 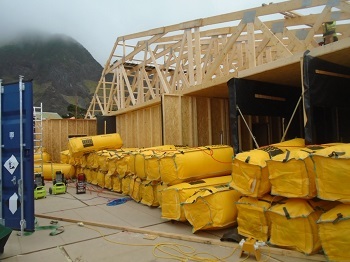 Above and right: The yellow bags are air bags used for fall protection. If somebody accidently fell off the roof the air bags would take the impact. 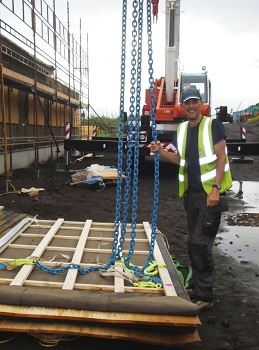 Photos from Barry Davies showing the erection of roof struts on the new healthcentre on the 25th January 2017. 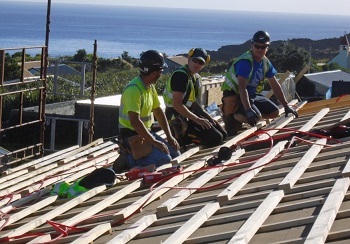 The Galliford Try team reached an important milestone when the floor of the new Camogli Healthcare Centre was completed on Friday 6th January. 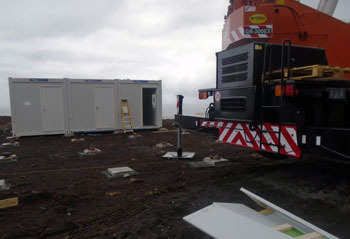 Weather conditions have not been ideal, as shown in photos below taken on site on 3rd and 6th January, and on Satuirday 7th there was a strong wind and heavy showers as worked progressed. 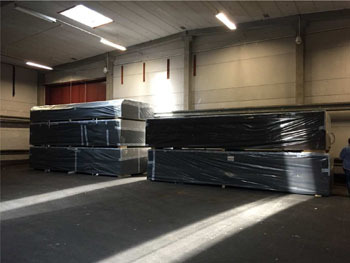 General view showing the completed floor on 6th January 2017. Photos taken on Monday 2nd January a few minutes before and after 09.00 GMT. Offloading of the MV Glory was completed at 18.15 on 26th December 2016. 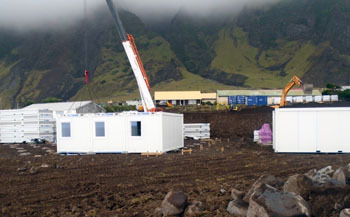 All the materials for the new Camogli Heathcare Centre are now safely onshore at Tristan da Cunha. 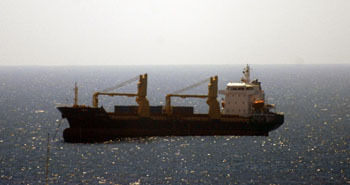 MV Glory arrived at Tristanon 4th nOVEMBER, but on only 11 days since has offloading been possible due to the adverse weather conditions. 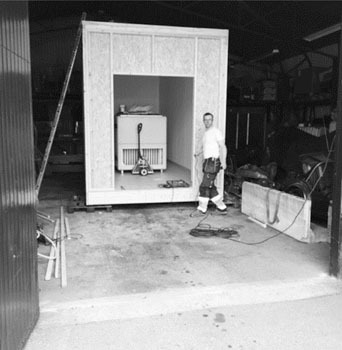 Both Christmas Eve and Christmas Day were again unsuitable, but at last, on Boxing Day the Galliford Try team were busy on site and helping islanders to offload MV Glory, which departed at 8.50pm GMT that night. 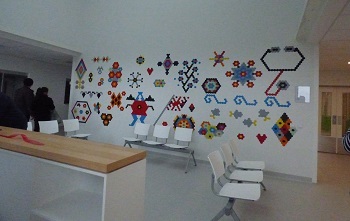 on the new Camogli Healthcare Centre. 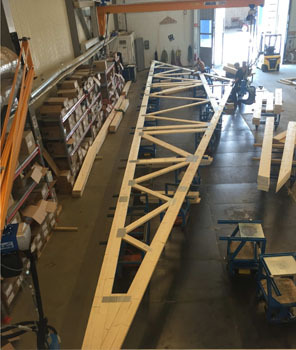 to form a frame to support the new healthcare facility. 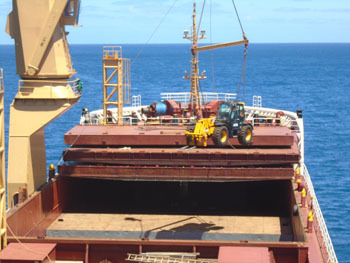 Unfortunately the weather has made offloading of MV Glory's 3,500 cubic metres of material and equipment very difficult, but the construction team on site are doing a commendable job. 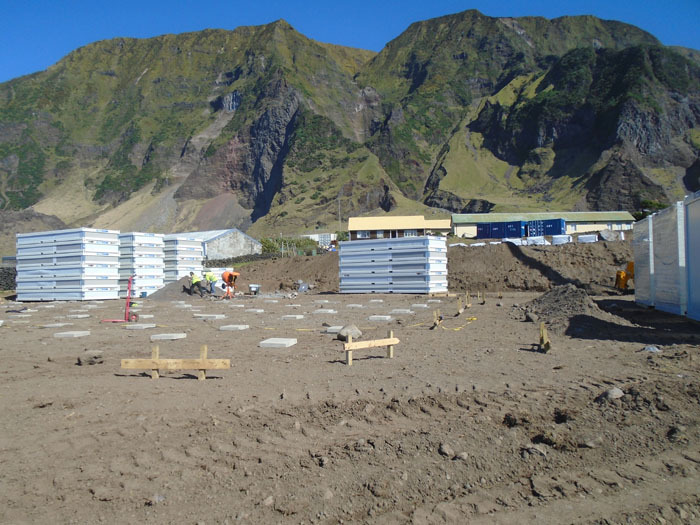 It is hoped by Break-Up Day on 20th December that the foundations of the new facilty will be complete, as well as site offices and on-site accommodation for the construction team in use. 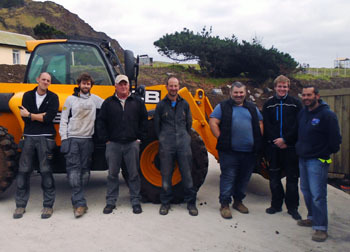 A second team of 10 Galliford Try construction workers is due to arrive on the island by 14th January. 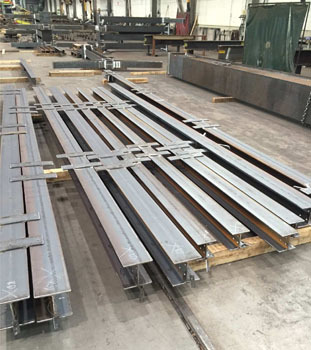 Galliford Try are making satisfactory progress on site in spite of the adverse weather conditions that have delayed the offloading of MV Glory. 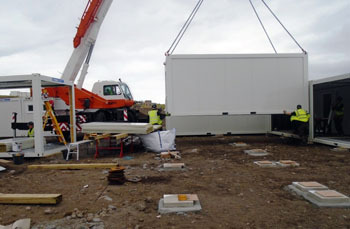 Photos from Barry Davies show views across the construction site on 13th December with foundation blocks being laid. 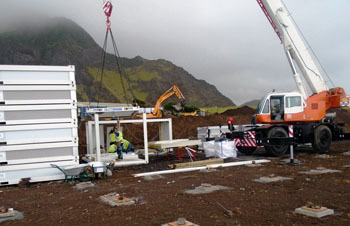 Another view of the site, a foundation block being lowered into place, and Galliford Try team members on site. 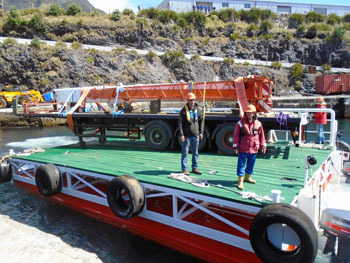 Offloading of the MV Glory is slow due to the heavy seas and winds we have had to endure the last weeks, we have about five days left for the offloading of the Glory plus the bad weather days. 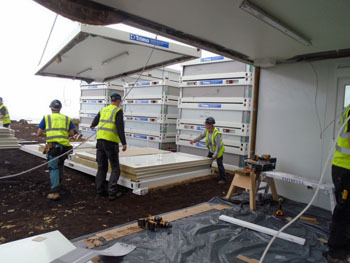 However, the contractors Galliford Try have about another ten days work in front of them with the materials on site. 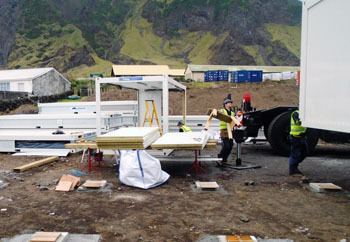 I am pleased to report that the Galliford Try construction team are motivated, committed and well organised, they are busy assembling the man-camp which is their living quarters and offices and the units and components are of a high standard and they are doing a good job preparing the ground base and in assembling the man-camp and these units should be able to serve the island after the project is completed. 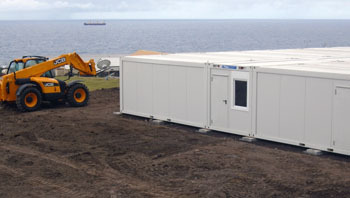 View looking north showing the construction team accommodation buildings being erected with MV Glory anchored offshore. 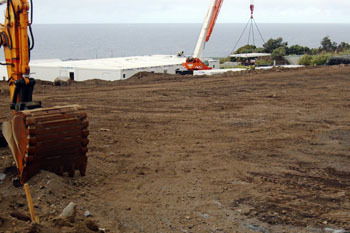 More views taken on 28th November of the Hottentot Fence building site for the new Camogli Healthcare Centre. In the Village Voice of 30th November there appears an advert seeking workers to help the contractors during the Christmas and New Year Holiday. Island break-up day this year is on Tuesday 20th December and any islanders who volunteer for extra holiday work between 21st December - 12th January 2017 will be paid double normal pay, with flexible working allowed, but not on Christmas Day, Boxing Day and New Year's Day which will be holidays for all. 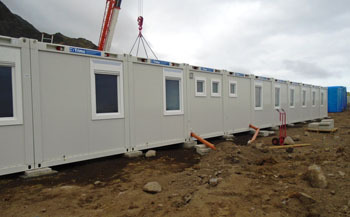 Barry reported on 23rd November that offloading of healthcare centre components from the MV Glory was 'painfully slow' but the team had sufficient materials for two weeks work. 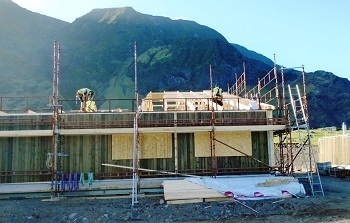 showing progress on the building of Camogli Healthcare Centre on a perfect day. 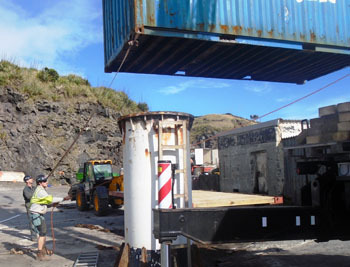 Photo from Clerk of Works Barry Davies taken aboard MV Glory on 17th November 2016 showing further unloading of cargo for the construction of Camogli Healthcare Centre. 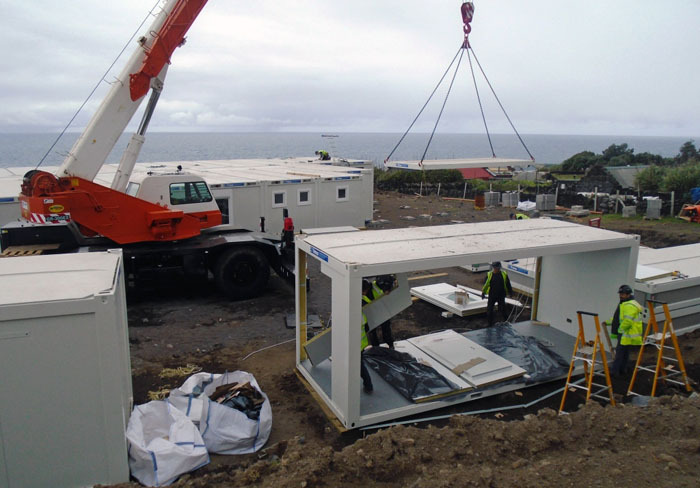 Photos showing first phase of the Camogli Healthcare Centre construction on 10th November 2016 as contractors prepare the site below the old Camogli Hospital on Hottentot Fence Field. 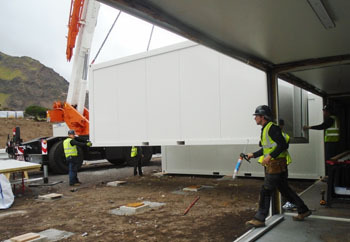 Photos from Clerk of Works Barry Davies show offloading of the construction plant for the new Healthcare Centre from MV Glory on 8th November in Calshot Harbour. 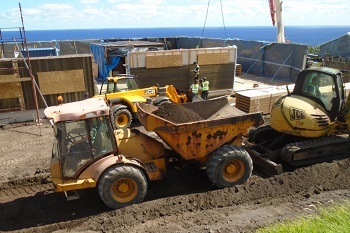 Starting on Monday 7th November, offloading commenced of the 2500 cubic metres of materials from MV Glory of construction materials, plant and equipment for the new medical facility. 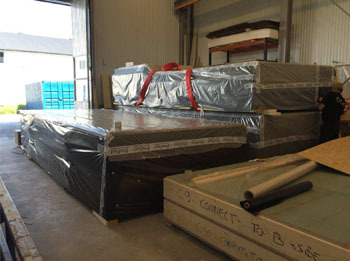 See below for photos of the construction and packing of prefabricated sections in Sweden. 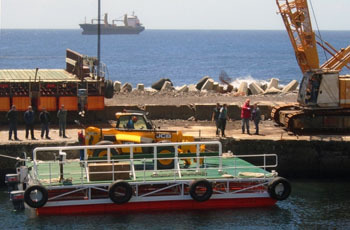 Offloading the 2500 cubic metres from the MV Glory to the new hospital construction site will involve most island departments and a lot of congestion and traffic movement around the island can be expected, as containers and crates will stored at various staging points around the island. 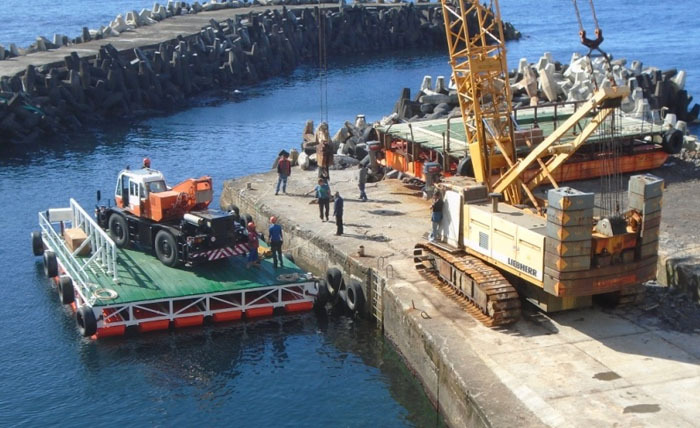 The Tristan workforce is used to flexible tasking and often 'all hands' are employed offloading vessels to bring crucial supplies ashore quickly as Camogli Harbour is often closed due to poor sea conditions. 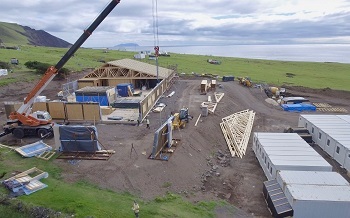 The island will be praying for good weather so that the huge Healthcare Centre load can be safely and quickly brought ashore for construction. 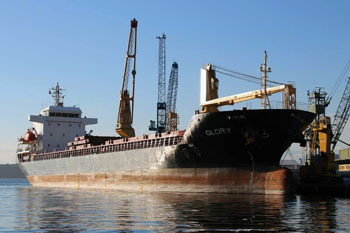 After unloading MV Glory is expected to depart on 25th November. 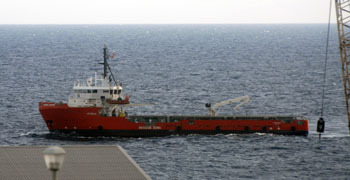 MV Edinburgh arrived from Cape Town followed later by the MV Glory carrying pre-fabricated parts for the new Camogli Healthcare Centre. MV Pacific Askari delivered Galliford Try contractors on Friday 28th October 2016. 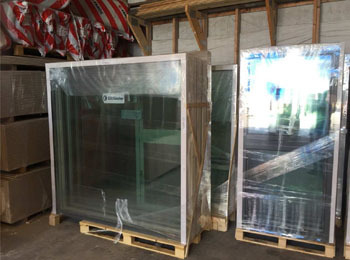 MV Glory is expected 4th November 2016. 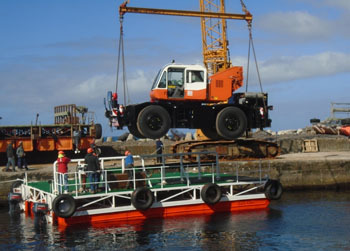 MV Pacific Askari has left Cape Town for Tristan with the Galliford Try construction team. 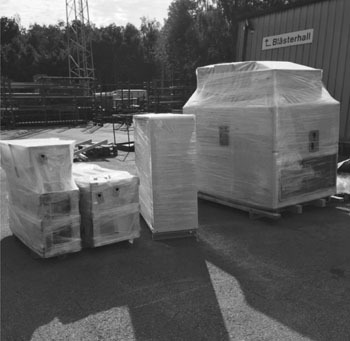 The MV Glory loaded pre-fabricated modules in Malmö and plant at Poole, and sailed for Tristan on the 12th October 2016. 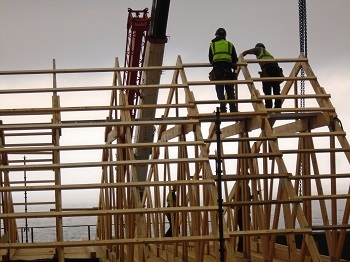 Clerk of Works for the project Barry Davies, now returned to Tristan preparing for the ship to arrive, visited Sweden in May 2016 and has sent the photo below showing construction of the pre-fabricated sections of the new Camogli Healthcare Centre. A new Camogli Healthcare Centre is planned to replace Camogli Hospital which was built in 1971. Architect images of the new Health Centre are published below along with more information and reaction from the island to this good news. 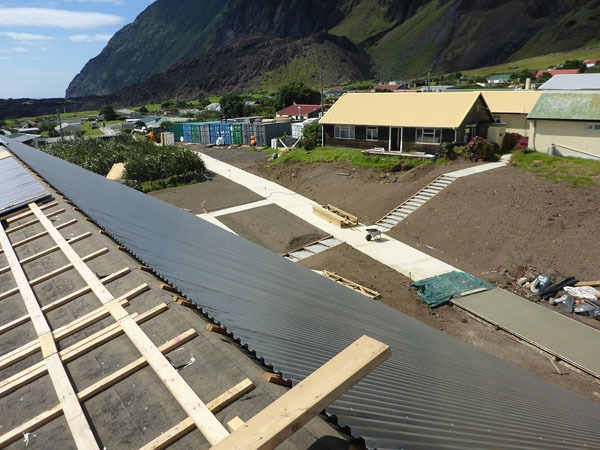 Hugh Broughton Architects has won a competition to design a new Healthcare Centre for Tristan da Cunha. 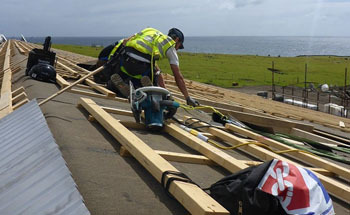 The architects will be working alongside contractors Galliford Try and Top Housing, to construct the new facility which will replace Camogli Hospital. 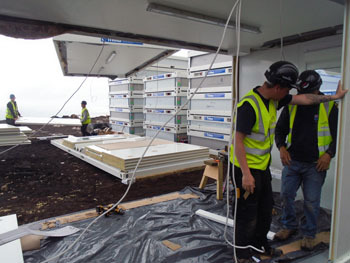 Hugh Broughton Architects, which collaborated with Galliford Try on the Halley VI Antarctic Research Station, will be using similar prefabrication techniques to build the flat-pack healthcare centre on Tristan. 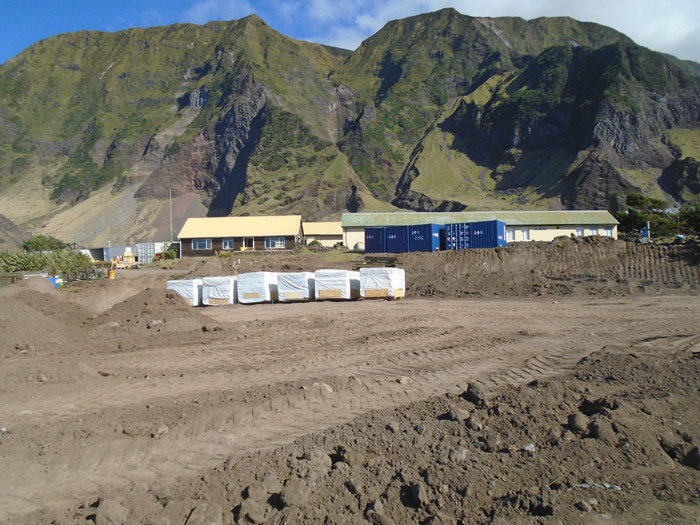 The Community of Tristan da Cunha are delighted that a new Healthcare Facility will be built on the island in late 2016. This has taken years of negotiation and Tristanians greatly appreciate all the support from the UK Government in ensuring the project can finally go ahead. 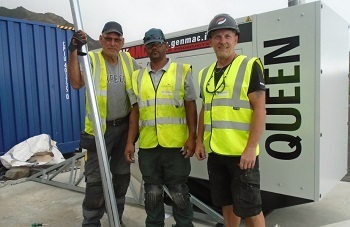 The Tristan Government is now working closely with the contractors to ensure everything runs smoothly in the run-up to the construction phase. 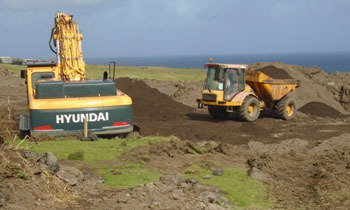 After many years of waiting for a contract to be signed, the Islanders are understandably now very keen for construction to start! 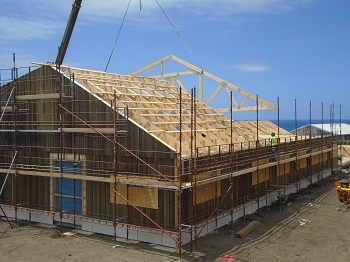 It will be wonderful to gain a new purpose built facility that benefits the health and social care of the whole island for future generations. This new facility will hopefully be the first step in a new 10 Year Roadmap in updating infrastructure services for the entire island.